Imperial Innovations has published its Annual Report and Accounts for the year ended 31 July 2014. Click the button below to visit the Annual Report website. We are focused on commercialising the best in UK academic research, drawn from academic centres within the 'golden triangle' formed by Cambridge, Oxford and London. We have end-to-end capability, taking research at the earliest stage and working with it right through to commercialisation. We are a technology commercialisation company, combining the activities of technology transfer, intellectual property licensing and protection, company incubation and investment. We are focused on the commercialisation of the most promising opportunities from a broad range of technology sectors, with particular expertise in therapeutics, medtech, engineering & materials and ICT. During the six months ended 31 January 2015 we invested £22.4 million in our portfolio. to support investment in and development of our portfolio of technology businesses. Our Technology Transfer team works with Imperial College London academics and students. We manage the translation of an idea into practice, working with academic inventors throughout the process of commercialisation, leading ultimately to licensing to industry partners, or the creation of new ventures. We work to develop new company opportunities based on leading UK academic research, working with Imperial College London (& our own Technology Transfer team), The Universities of Oxford & Cambridge and UCL. We have identified four particular areas of expertise, shown in the diagram below. 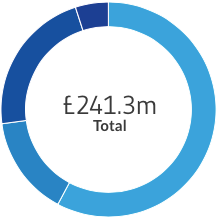 As at 31 January 2015, the value of the top 20 investments in our portfolio stood at £241.3 million. Internet of Things solutions provider specialising in fully integrated business solutions around connected product intelligence. Imperial Innovations is a technology commercialisation company that combines the activities of technology transfer, intellectual property protection and licensing, company incubation, and investment.